Iris Luckhaus is a freelance illustrator, stylist and designer (MoD, University of the Arts Berlin, Fashion Class Vivienne Westwood) since 2000. She is currently living in Wuppertal and Berlin, Germany, and working for international clients. In reknown anthologies like "Illustration Now! ", "Freistil" and "Illusive", Iris Luckhaus is repeatedly featured as one of "the best illustrators worldwide". Iris Luckhaus is a freelance illustrator, stylist and designer (MoD, Berlin University of the Arts, Fashion Class Vivienne Westwood) since 2000. And if that’s a necessary part of projects, she might as well work as a graphic designer, author, lector, translator, reader, inventor, supergirl, photographer, programmer or everyday life spy. Her passion in all this is visual storytelling, always with a friendly approach and often in details noone might see at first sight. Besides her love for details, she is well known for drawing curvy fashion girls and for the character Lily Lux, which she created, wrote, illustrated and designed in cooperation with Matthias Klesse. The different fields she works in influence and inspire each other, and she highly enjoys the challenge of learning new things with every project; regarding techniques, content or anything else. And she usually smiles when she is drawing. 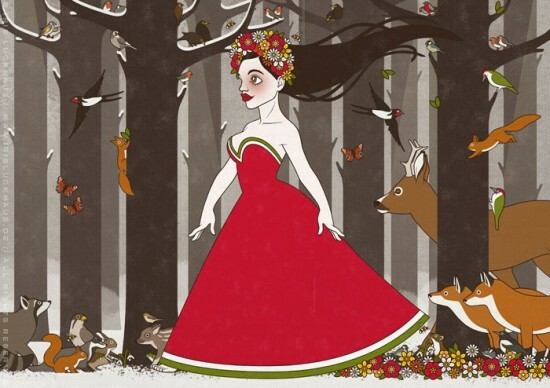 She is a member of the Illustratoren Organisation and the European Illustrators Forum. In the past, she has worked as well as an instructress for Fashion Illustration at the Berlin University of the Arts. In reknown anthologies as Illustration Now!, Freistil or Illusive, she is repeatedly featured as one of the “world’s best illustrators”. Iris Luckhaus is living in Wuppertal, Berlin and sometimes in Paris, and working for very different clients from all over the world. In reknown anthologies like "Illustration Now! ", "Freistil" and "Illusive", Iris Luckhaus is repeatedly featured as one of "the best illustrators worldwide". © 2019 Iris Luckhaus. All rights reserved.